COMPASSIONATE CLIMATE ACTION: 32 Days - Is This a First Step to Revamping Our Economic System? 32 Days - Is This a First Step to Revamping Our Economic System? Some good news from the United States Securities and Exchange Commission (SEC) — a change that might make it easier to safeguard the future. The SEC made a decision recently that will make it easier for shareholders to request climate change risk disclosure from public companies. This might not sound like much, but in the capitalist game, it could make a huge difference to the future. Everything bad that corporations do, they will tell you it's because they have to make money for their shareholders. At any cost, it sure seems. More and more investors are filing resolutions requesting information about the financial risks companies face from environmental and social issues, such as climate change. In the past, the SEC allowed companies to reject these resolutions and keep them from going to shareholder vote. Apparently, a favourable outcome for a resolution "would involve a negotiation between the company and shareholder, with the company agreeing to the demands and the resolution withdrawn. The company would then report on its progress of its commitment." In this online article at ClimateBiz, we learn that in 2009, "U.S. and Canadian investors filed nearly 70 shareholder resolutions with an environmental focus, such as making companies measure and manage their greenhouse gas emissions or develop and share climate change strategies. This was an 11 percent increase over 2008." 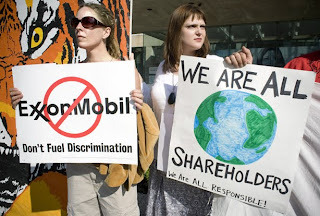 "Some big-name companies that have bowed to shareholder pressure on changing their environmental policies include Home Depot, Chevron and McDonald's." As You Sow focuses on corporate social responsibility, and they offer Unlocking the Power of the Proxy. If you own stocks, flex your shareholder muscles and put forward a resolution next year to have that company report their risk due to global climate change. You can ask them to report on greenhouse gas emission reductions, as well.